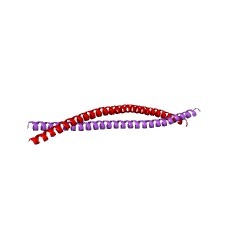 The domain within your query sequence starts at position 92 and ends at position 403; the E-value for the Filament domain shown below is 4.05e-163. Type IV: Neurofilaments L, H and M, alpha-internexin and nestin. All IF proteins are structurally similar in that they consist of: a central rod domain comprising some 300 to 350 residues which is arranged in coiled- coiled alpha-helices, with at least two short characteristic interruptions; a N-terminal non-helical domain (head) of variable length; and a C-terminal domain (tail) which is also non-helical, and which shows extreme length variation between different IF proteins. While IF proteins are evolutionary and structurally related, they have limited sequence homologies except in several regions of the rod domain. The IF rod domain is approximately 310 residues long in all cytoplasmic IF proteins and close to 350 residues in the nuclear ones. The IF rod domain exhibits an interrupted alpha-helical conformation and reveals a pronounced seven-residue periodicity in the distribution of apolar residues. The heptad periodicity within the rod domain is interrupted in several places, which generates four consecutive alpha-helical segments: 1A and 1B, which together form the so-called coil 1, and 2A and 2B, which form coil 2. The four alpha-helical segments are interconnected by relatively short, variable linkers L1, L12 and L2 [(PUBMED:12596228), (PUBMED:22869704)]. IF proteins have a very strong tendency to dimerize via the formation of an alpha-helical coiled coil (CC) by their rod domains [(PUBMED:22869704)]. There are 20668 Filament domains in 20433 proteins in SMART's nrdb database. Taxonomic distribution of proteins containing Filament domain. This tree includes only several representative species. The complete taxonomic breakdown of all proteins with Filament domain is also avaliable. Click on the protein counts, or double click on taxonomic names to display all proteins containing Filament domain in the selected taxonomic class.